Choice of 2-1/4", 4", 6" or 8" digit heights, 4 digits. Choice of panel mount, wall mount or suspension mount. Choice of 95-264 Vac or 11-30 Vdc power. Optional front panel programmable analog output, dual 5A relays, and serial data output. Standard PC programmable analog output and dual 120 mA AC/DC solid state relays. Only 3.0" (75 mm) deep. MAGNA Large Digit Temperature Displays can be ordered for four RTD types (DIN Pt100, ANSI Pt100, nickel or copper), or for seven thermocouple types (J, K, T, E, N, R, S). Four red LED digits show temperatures in °C or °F and 1° or 0.1° resolution. Viewing distances up to 320 ft (100 m) are achieved with large digits for reading across a plant floor or an outdoor yard. Four digit heights are available: 57 mm (2-1/4"), 102 mm (4.0"), 150 mm (5.9"), and 200 mm (7.9"). A rule of thumb is that viewing distance in feet is 40 times digit height in inches, or in metric terms, that viewing distance in meters is digit height in millimeters divided by 2. Segmented digits are used for normal brightness 2-1/4” and 4.0" digits. Individual 5 mm LED pixels are used for larger digits and for outdoor brightness versions. can be mounted inside or outside of the display housing, as ordered. Remote transmitter mounting allows long RS485 cable runs while keeping the RTD or thermocouple leads short. Environmental sealing to IP65 (NEMA-4X) is standard. Electrical connections are via water-tight compression glands. A built-in heater is optional for outdoor operation down to -25°C. Mounting options are panel mount, wall mount or suspension mount. Optional outputs are an isolated analog output, dual 5A relays for alarm or control, and an RS232 or RS485 serial data output. These options are implemented by add-on boards and are programmable from the display’s front panel keypad. Standard outputs that come with the Laureate transmitter are an isolated analog output and dual 120 mA solid state AC/DC relays. Their setup requires connection to a PC via the transmitter’s RS485 port, and it uses Laurel’s free Instrument Setup Software. 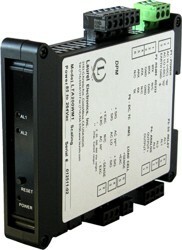 A Laureate RTD or thermocouple transmitter can be mounted inside or outside of the display housing. Brightness Indoor or outdoor brightness as ordered. Five keypad adjustable brightness levels. Output Levels 0-20 / 4-20 mA into 0 to 500Ω, 0.4 µA resolution. 0-10V into loads > 600Ω, 0.2 mV resolution. -10 to +10V into loads > 600Ω, 0.4 mV resolution. Special Features Forward or reverse action possible. Manual or automatic in-flight compensation. Energize or de-energize on trip. Adjustable timers to set energize and de-energize delays. In-band and out-of-band alarm function. Output Types RS232 or RS485, addressable, on demand or continuous output. Special Features Can include time and date with RTC option fitted. Operating Temperature 0°C to 50°C, non-condensing. -25°C to 50°C, non-condensing, with MHTR AC heater option. Note: Models with 57 mm (2.2") digits come with the larger 6-digit case. 25 mm (1.0") for cable glands in back of the case. Click on the radio buttons to build a model number with pricing (shown below the Ordering Guide). Prices are in US dollars and do not include shipping or duty charges (export sales). Please see our explanations and limitations applicable to pricing and online orders. Prices shown are in US Dollars and are Laurel's manufacturer's suggested retail price (MSRP) in the USA. Orders are processed manually, not directly by our shopping cart system. You don't have to supply credit card information when placing an online order. Note: The same RTD signal conditioner board can be user configured for all RTD types listed and °C or °F, as well as for resistance ranges 0 to 20, 200, 2K, 20K, 200K ohms. Indicate if signal conditioner is to be inside or remote. Note: The same signal conditioner board can be user configured for all thermocouple types listed and °C or °F. Indicate if signal conditioner is to be inside or remote.